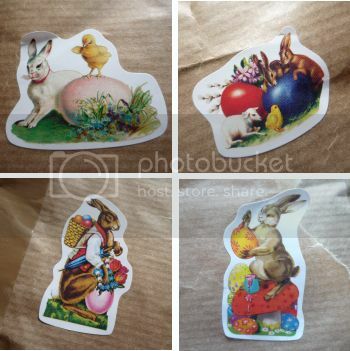 MaiTai's Picture Book: Happy Easter! 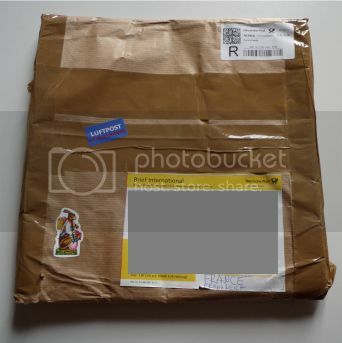 A few days ago, I was greeted by a wonderful surprise... an Easter bunny must have hopped by and deposited it in my mailbox.. Inside was a lovely greeting by a most generous and sweet scarf fairy, and this beautiful italian silk scarf. The combination of it's soft blues and light neutrals feels so fresh and spring like, and it is just perfect for so many pieces of the capsule wardrobe. Mille merci, my dear scarf fairy, I will cherish this treasure for always. Wishing everyone a most wonderful remaining Easter holiday! The scarf fairy selected a gorgeous scarf, the colors are very flattering. What a lovely surprise, kudos to your fairy! So happy to see the Easter bunny dropped this off for you! Lovely Italian silk that looks beautiful on you and will work with so many things in your wardrobe. I agree, kudos to your fairy!! What a delight your brunch must have been! I love the care you brought to the presentation. I hope you had a great Easter celebration with your family. Frohe Ostern, dear MaiTai and family. 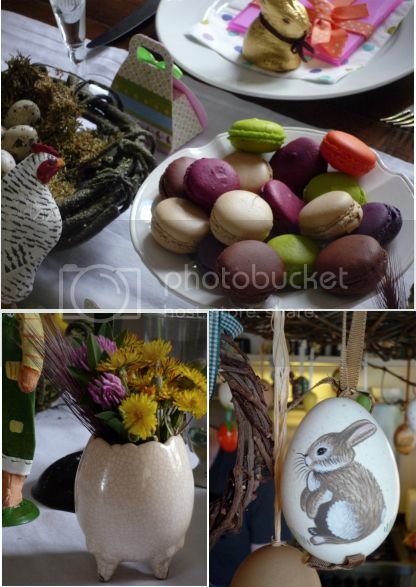 What a gorgeous Easter table. I always love those Lindt bunnies and have the fondest memories since early childhood of them. Your scarf is lovely and your wear it beautifully! Happy Easter dear MT! The Easter bunny dropped you a lovely scarf! It suits you so well. Beautiful scarf- it would go with my entire wardrobe! And thank you for your blog and your commentary.from day to day, it's a daily read for me. My fur collars never fail to receive great compliments a and you've converted me to the wonders of Hermes! I look forward to future daily reads! Your easter table looks gorgeous Maitai, as does the scarf, Happy Easter. Many wishes from Crete..I visited your blog with my momther and she loved it!! 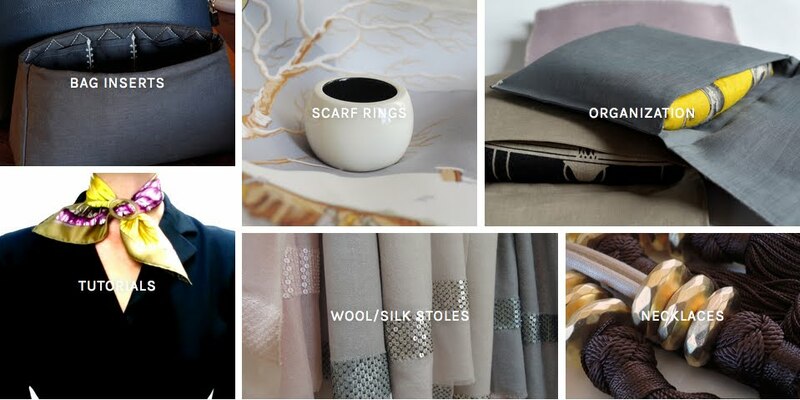 The table is simply stunning and your scarf fairy has surely attended all your scarfie lessons and has been a veeery dedicated and attentive pupil, therefore she has chosen the scarf which suits you perfectly. I feel your scarf fairy lives in Germany and I hope to meet her travelling to Germany on monthly basis, lol (hoping she is a really generous fairy). 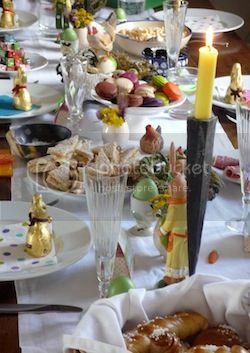 Your easter feast looks so pretty and colourful and laden with chocolate and sweet things, as it should be! I could not agree more with on the fairy, dear Lisa! Mwahs and thanks, my dear Trudye! Will probalbly wear a silk tunic and linen trousers to watch the happy event, can’t wait to see what the bride will be wearing! Belated Easter hugs to you, hope you had a lovely time! Dear Jana, we don’t have brunch very often, but I just love Easter breakfast with eggs, brioches, smoked salmon and champagne! Merci, dear ritournelleblog, so nice to hear you like the table. Hope you had a wonderful Easter too. 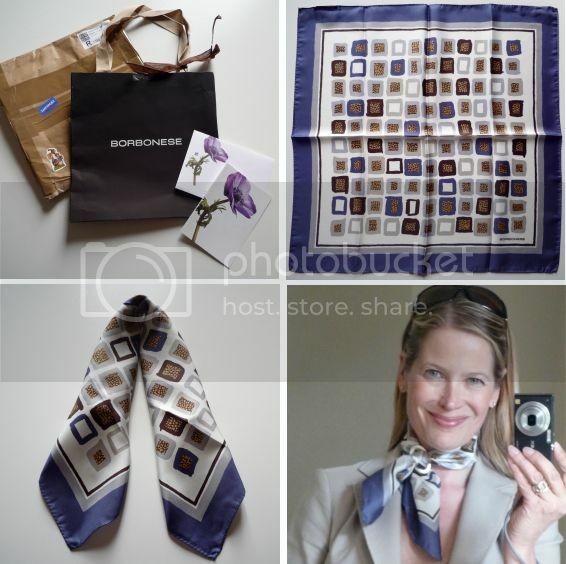 Thank you for the good wishes, my dear booksnchocolate, happy you like the scarf! Dear Janelle, so lovely to hear you enjoy it here and happy the fur collars have been a success, many thanks. Orange greetings! What a special joy the first Easter with Baby FF must have been, my dear Faux Fuchsia! Loved the pics of the family outing on the beach. Will watch the royal wedding with friends, looking forward to our ‘wedding party’! Dear Lilian, the scarf fairy has certainly great intuition! And so have you, my dear, guessing where the scarf has come from ;-) Wishing you much fun on your monthly travels, blowing some fairy dust your way.. Such a beautiful tablescape, I'm going to save this for inspiration next year. Thank you, dear Tabhitha, so happy to hear you like the set up!